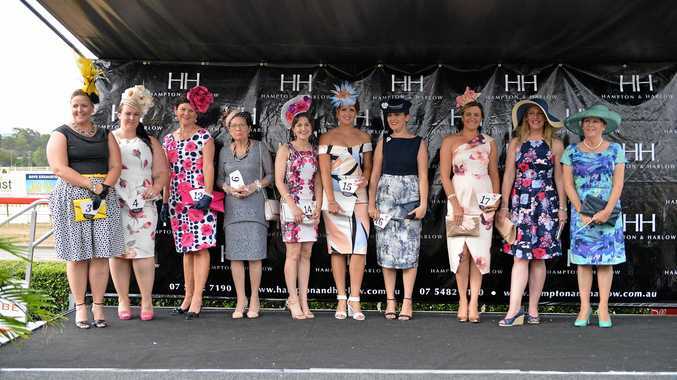 A PERFECT day and with the fashion stakes getting higher each time, Saturday's Gympie Cup Race Day, Fashions on the Field was a huge success. Judges Judy and Augustine Tso from Brisbane chose Tracey Lourigan as their Ladies Classic Racewear winner, with Carol Stewart as runner-up. The Contemporary category was taken out by Bonnie Cutting, with Aimee Warren runner up. Both winners received a $100 voucher from Hampton & Harlow, a $100 voucher from Mia Bella Jewellery, and $150 from Gympie Turf Club. The runners-up took home $100 from Gympie Turf Club, plus a $50 voucher from Hampton & Harlow. Best Headwear was awarded to Verelle O' Shanesy and Verelle received a $100 voucher from Hampton & Harlow plus a $100 voucher from Marla online boutique. $100 voucher from Hampton & Harlow and $50 from Gympie Turf Club. Michelle and Kevin Liddicoat, as runners-up, received a $50 voucher from Hampton & Harlow plus $50 from Gympie Turf Club.